Forget the treadmill and that complete set of dumbells—getting in a good, heart-pumping workout can be as easy as 52 cards and a bit of floor space. The premise for a deck of cards workout is this: For each suit in the deck, assign an exercise. For instance, spades are push-ups, diamonds are squats, hearts are alternating lunges and clubs are crunches. Flip through the deck of cards and for whatever suit turns up, do that exercise the number of times the card indicates (a two of spades would equal two pushups, an eight of hearts would equal eight lunges, etc.) 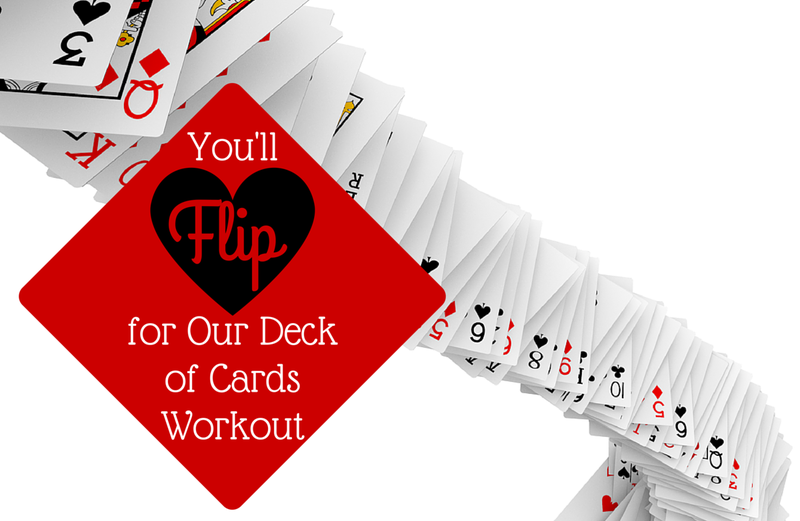 Play with the deck options to find a workout that works best for your body and endurance level. Variations include assigning face cards a number for extra work or removing them from the deck completely. You might also identify joker cards as a one-minute rest period and ace cards as a one-minute cardio interval. Alternatively, you can assign an exercise to each number and a number of reps for each suit. For example, clubs equals five reps, hearts equals 10, spades equals 15 and diamonds equals 20. Then, the number two could be assigned push-ups, threes are mountain climbers and on up the line. Using a deck of cards to direct your workout not only allows you to choose your level of difficulty, but it also results in limitless ways to shuffle and diversify your exercise routine so you never become bored. Every day presents a new chance to get creative with the amounts and kinds of exercises you can do. Plus, we’re willing to try anything that works for Carrie Underwood and her strong legs. Pick your preferred skill level, grab your favorite deck of cards and get started with one of the examples below.